A fabulous offer which was perfectly timed for the birthday of the littlest boy of the family. Scottish Mum Blog jumped at the chance to take up Wowee Light Strike Product review and eldest did his first youtube bit – his nerves get less and less as the time goes on. The box arrived a few days before his birthday, and as it came around 8pm at night, littlest sadly saw the huge box that ended up sitting in my garage for the few days. There were all sorts of questions and guesses around what could be in such a big box and it was quite nice to see that he didn’t storm the garage in the dead of night to open the box. Recommended for age 8 +, these are the products that my boy has hankered after for a while now. I could talk about these for ages as they are all flashy lights, fabulous sound systems and the only thing we were missing to make it a fully fledged laser tag type set up was the jackets. I can see the jackets being on the Xmas list this year. The boys were over the moon to be playing with this set, and I don’t blame them. Flashing lights, pretend guns and safe targets lets them play at superheroes and cops and robbers all day. You need a lot of AA batteries though for everything so make sure you stock up on them if you buy these and take them home. We’ve been using ours a lot and the original Duracell batteries seem to have coped well. The simplest way to let you see what the guns to is to show you elders first attempt at you tubing his opinion on something. He’s done pretty well for a first attempt, and for someone who struggles doing talks in front of groups. Forgive the video for being a little dark, but he’s so proud of what he’s done, that he wanted it to be posted online. 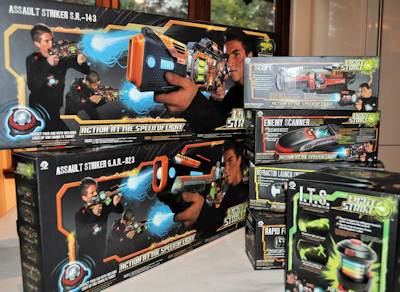 Disclosure – We were given the Light Strike products for this review. I think he did really well. Thank you. He’s keen to do another one very soon.. Think your boy has done a grand job! Mine would love a go with these! He got stronger as the time went on. Afterwards he said he thoroughly enjoyed it and wants to do more. I may be encouraging a future youtube habit. he did great! Well done! Didn’t he just. He’s really happy about it now.